Cars of every genre gather up at the Tokyo Bigsite! 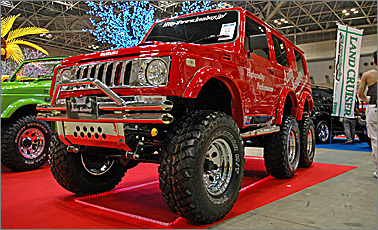 With this year's theme being the revitalization of the aftermarket parts industry, the 6th annual Auto Gallery Tokyo event has once again taken place. Rows and rows of beautifully constructed vehicles from sporty tuning cars to imported vehicles, Minivans, VIP cars, SUVs and 4WD machines graced the showroom floor. The direction of the tuning trends not only pointed towards the mainstream, but plenty of emphasis on originality were displayed on these custom machines. * A Macromedia Flash Player 8 may be necessary to view. Please download from here. 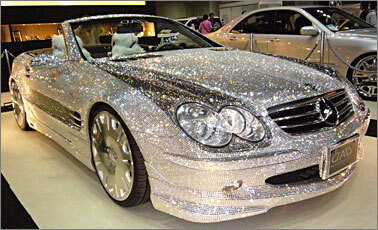 Covered entirely of over 300,000 Swarovski crystals, GARSON's DAD LS-Edition Mercedes had taken this year's Auto Gallery Tokyo 2006's custom car contest grand prix award. The visual impact the vehicle displayed when it shined under the bright showroom lights will not be forgotten for many years to come. To own this vehicle is like a dream and may not be suitable for people who like to avoid attention. We wondered how much this masterpiece took to complete. 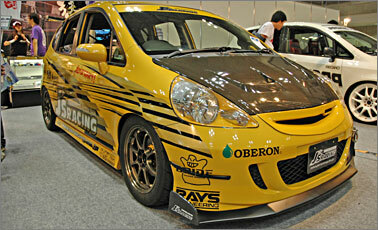 This Honda Fit was constructed to enjoy its performance on the streets as well as the race track. J's Racing decided to install their shop original L15A high compression (11.4:1) motor setup to put some punch into the horsepower. Strengthening bars were added to the pillars, monocoque, crossmember, floor, and lower arm. The suspension was fitted with J's Racing's custom damper kit. The finished product was a street machine that runs the Tsukuba circuit in 2 min 45 seconds! All exterior components come from Auto Kenboy's original parts line up. The reverse housing suspension kit lifts the body 4 inches higher than stock height by using extended shackles for a balanced lift. Anyone can tell the most extravagant modification of this machine is the 6 wheel chassis layout. It makes us want to take this thing off roading! 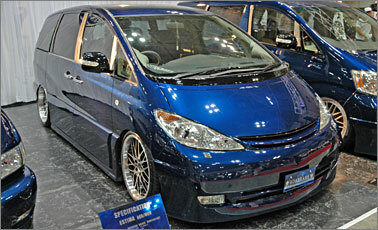 According to its doors and side skirts, this Estima received a square bottom styling. The exterior was smoothed out with built in fog lamps in the front bumper as well as the hood spoiler. The Airdyne air suspension kit was installed for full vehicle height adjustability anywhere, any time. The 19 inch rims and tires were chosen to dress up the machine a bit more.